The question “Where are we heading?” seems to be popping up in my head more frequently these days. A recent ad of a health food brand targeted towards 2-5 year olds forced me to hit my head hard and ask myself, “Is it the heights of laziness? Are people actually going to buy this pack and feed their growing kids? Where are we heading?”. These hard questions were triggered by this latest product from Nestle named “Ceregrow” targeted towards 2-5 year old children. Their positioning is that kids have small tummies but need more nutrition ("Big nutrition for small tummies”). With their earlier brand “Cerelac” having become a household name that is commonly fed to infants and toddlers (6 - 18 months), their next target is obviously the subsequent age bracket of 2-5 year olds. 1) Kids of 2-5 year olds should be eating the regular table foods eaten by the other family members. Why do they need a separate cereal box? 2) Kids of 2-5 year olds would already have got their baby teeth. Why do they need a cereal of gooey texture? 3) Kids of 2-5 year olds should have been exposed to a wide variety of fruits and vegetables by then. Why do they need the vitamins and minerals from a factory produced pack? Have we *tried* enough with a variety of regular table foods, fruits and vegetables, before we succumb to the reason - “My kid is lacking nutrition. So I need a supplement produced in a factory”? 1. Ingredients list has 30+ items. Do we know what each means and why they are added? 2. 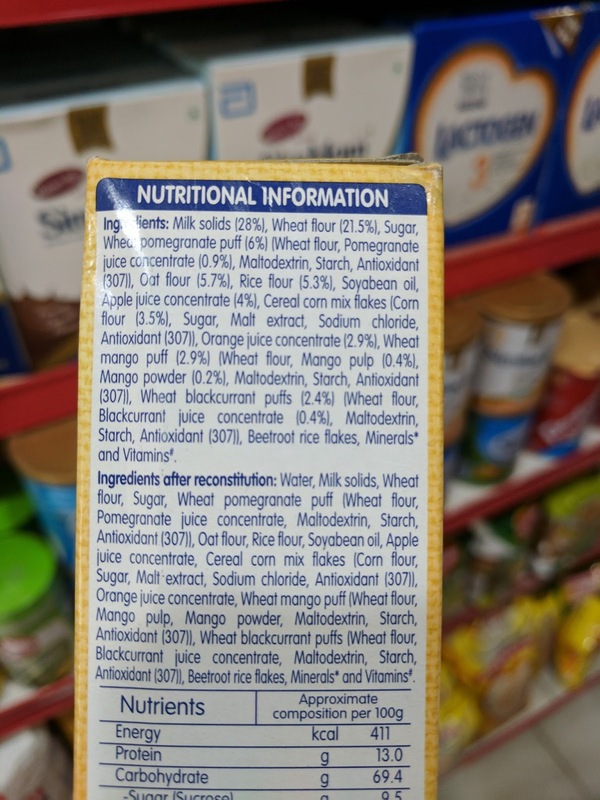 The % of sugar is not given, although it is the 3rd item in the list. It is repeated again somewhere down the list. Do we know the total amount of sugar added? 3. Maltodextrin is repeated twice in the ingredients list. Do we know what it means? 4. Wheat flour is the 2nd item in the list. Do we know whether it is refined (maida) or wholewheat? 5. The pack of 300 gms costs Rs.250. Recommended serving size is 50 gms per day, which implies the box would get over in 6 days. The cost comes to Rs.42 per day. A serving of a bowl of fruit and veg to a 2-5 year old would be far less than that. Why do we need to spend on such expensive, packaged foods? Is it because we don’t have the time to chop a bowl of fruits / steam a bowl of veggies? Friends, I’m sorry if I sound rude. I just cannot fathom the fact that the food industry thinks such food is needed for Indian children, when our food traditions are all about health and nutrition. Have we gone that far from our roots, that a packaged brand can blatantly claim that our growing children need additional nutrients that are not available in our traditional food preparations? And please let’s not blame our innocent kids and say, "My child doesn’t eat anything home-made / healthy". There are numerous ways by which we can incorporate nutritive and wholesome ingredients in everyday meals. Have we tried enough before we came to that conclusion? Whenever I watch an ad these days, I pay keen attention to how they try to resonate with their target audience in a subtle, but clearly manipulative manner. Take a look at this Nestle Ceregrow ad. The dad is feeding the child, while the mom is talking to them through Skype. The dad feeds some food but the mom is not sure about the nutrition in it. In the next scene, the grandmother is shown feeding the child a bowl of Ceregrow and the child seems to be finishing it. Working moms depend on family support for raising the child. In a subtle way, the brand conveys that it is easy for other family members to feed a bowl of Ceregrow instead of regular table foods that take time and can get quite messy. The third scene shows that the mom is worried about the immunity of the child and a “doctor” seems to recommend this product. Why aren't there strict laws against brands using THAT doctor coat in ads? Why are doctors NOT opposing the misuse of the doctor coat? If a parent is really worried about immunity, the child should be eating real pomegranates, real apples, real oranges and real mangoes. Not the preserved “juice concentrate” of these fruits, that too in minuscule quantities from such gooey cereals. The product has 30+ ingredients. Around 40% of the ingredients is MAIDA in various forms (fruit puffs). Contains 1.5 tsp of sugar per serving. Hardly any fibre (0.5g per serving). What “full nutrition” are they talking about? 2-4 year age bracket is extremely crucial for building healthy eating habits. If such sugar-coated gooey cereals are given on a daily basis, then the child will never eat fruits, veggies and home cooked meals. And we would end up labeling the poor child as “fussy eater” and then go hunting for a bottle of “Pediasure”. Thanq so much for the valuable information.a very good article for the parents.thnq so much once again. @Unknown, please read the full post and decide for yourself. us emotional fool by this type of adveadvertisment. Good analysis and information madam. Thank you so much. I am about purchase this for my baby. @Unknown, Are you working for Ceregrow marketing team? Go and check my home page where there is a link for "Packaged foods analysis". I have written about ALL popular junk foods (Maggi, chocolates, juices etc). Its not that we give such foods everyday , its only when we go out abroad or when I baby is fuzzy to eat home cooked food maybe they get bored. There's no harm in giving cerelac or ceregrow once in a while. I get the point. Very true. But then, help me with this. In case there is a situation and cooked food is not available, can we not feed my two plus boy a bowl of this? This would not be more than twice or max thrice in a month. @Shaikh Sohail, I would suggest to avoid such foods altogether since there are options available while traveling - fruits, dry fruits/nuts, idli or paratha that can be packed if possible. If these wouldn't work out, it is okay to give such cereal once in a while but not on a daily basis. can you explain what is the problem with the cereal..? and you also provide solid facts and not emotional turn away please. @unknown, I have spoken about the real facts as well. What about the 30+ ingredients, maida in various forms, 1.5 tsp sugar per serving, hardly any fibre? Do we know if there is any nutrition in fruit juice concentrate? What about maltodextrin - what are the side effects of this ingredient in a 2 year old's diet? If these are not problems with this cereal, I don't know what is. To all who are supporting the fact that once a while and why not one bowl a day..so on. please watch a movie called Consumed and you will come to know how the corn starch/ maida etc that is used in every food products affect us after some time.These effects cannot be even cured by medicine because no doctors have found such effects before in their studies due to GMO corp.
Don't give these products.. For 3 years more give them natural foods. . Playing if u gave these type of foods ur child will surely admit in hospital one day... As a mother of 3 years son I know the pain please don't be lazy don't give these packed foods. .